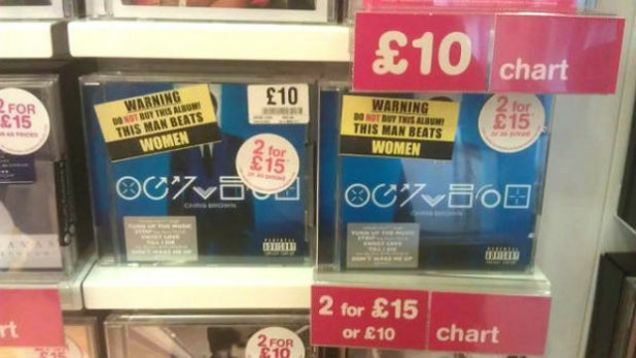 Customers shopping for CDs at HMV stores in London have reported seeing an "advisory label' on Chris Brown's latest album warning patrons not to buy the album because "this man beats women." Brown was charged with felony assault in 2009 after he physically abused his then-girlfriend Rihanna. He pleaded guilty and was sentenced to five years probation, as well as community service and domestic violence conseling. It's unclear how the stickers got on copies of Fortune, Brown's fifth studio album, but Gigwise reports that there are believed to have been placed on the CD cases by anti-domestic-violence activists. 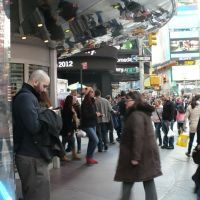 Despite negative reviews, Fortune, which was released in late June, debuted at number one on the album sales charts both in the UK and here in the US.